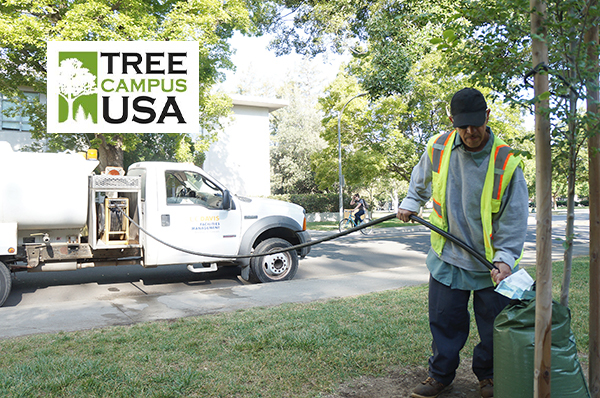 Willie Hernandez, groundskeeper with the UC Davis Arboretum and Public Garden’s grounds and landscape services team, fills a slow-release watering bag called a “SaplingSoaker” from a campus water truck. These bags provide our smaller campus trees with targeted protection from the drought while helping prevent run-off and water loss due to evaporation. We take our campus trees seriously. They are valuable both environmentally and aesthetically, but they’re at risk because we’re dialing down the irrigation on the lawn around them. To avoid this conundrum teams from the UC Davis Arboretum and Public Garden’s grounds and landscape services team have started irrigating our younger trees with slow-release watering bags—a fancy description for those big green zippered sacks starting to appear at the base of young trees throughout campus. “We can’t rely on our sprinkler systems anymore to water our trees, especially since we’re cutting back watering our lawns even more dramatically than last year,” says Avery. “Instead, on young trees—those with trunks about 5 inches or less in diameter—we’re using SaplingSoakers and filling them up manually using our water truck. Avery and Forrest know a thing or two about saving water in landscapes. Their teams have already cut back the campus’s utility (landscape) water use by over 30%—well ahead of Governor Brown’s 25% reduction mandate. Have an older tree? TRIC it out using the Tree Ring Irrigation Contraption. LEARN MORE here.